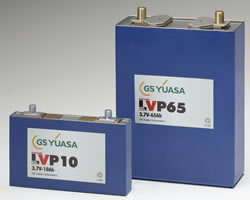 Japan's largest electric car battery maker, GS Yuasa Corp, is in talks with Canadian auto parts maker Magna International to produce batteries in Europe, a source said, in what would be its first foray overseas. GS Yuasa, whose lithium-ion batteries already go into Mitsubishi Motors' i-MiEV, the world's first mass-produced electric car, has aggressive plans to expand sales as the global electric vehicle market grows amid concerns about climate change. "The fact that they are likely to launch this venture with Magna, and not (their Japanese partner) Mitsubishi Motors, is a positive step as they will have more opportunities to sell their product to new customers abroad," said Jun Yamaguchi, an analyst at Credit Suisse. Magna's customers include Ford Motor Co and BMW. Shares in GS Yuasa, popular among Japanese retail investors, climbed 3.3 percent to 619 yen in active trade, outperforming a 1.2 percent rise in the broader market. The companies' plans call for a 40 billion yen ($466 million) factory in either Spain and Austria, that would likely start operating in 2012 and eventually manufacture lithium-ion batteries for 50,000 cars annually, the Nikkei business daily reported. The batteries will likely be used for a new electric vehicle that French firm PSA Peugeot Citroen Group plans to produce in Spain, the Nikkei said. GS Yuasa will probably take a majority stake in the joint venture, while Magna will hold 20-40 percent, with trading house Mitsubishi Corp also taking a stake, the newspaper said. GS Yuasa said last year it aims to boost its annual lithium-ion battery sales by more than 30-fold to 100 billion yen ($1.1 billion) by March 2016. It has been producing lithium-ion batteries in Japan in a joint venture with Mitsubishi and Mitsubishi Motors Corp since last year.